When it comes to instagram, I've always been a bit of an organisation freak when it came to themes. I started off my very first instagram page as one of those 'lets take my perfume bottle, put it on my ikea bed sheet and take a photo' sort of pages, and surprisingly I gained around 11,000 followers from choosing a theme and sticking to it. I now have three different instagram pages believe it or not, and only one of them is themed - my blog IG, @isabellekateblogs. Since starting this page only a couple of weeks ago, I've developed a clean and airy white theme that hopefully I'll be able to stick to! I know that when I'm scrolling through the feeds of my favourite bloggers and instagrammers, I'm always wondering how they get all of their posts to look so beautiful and uniform. 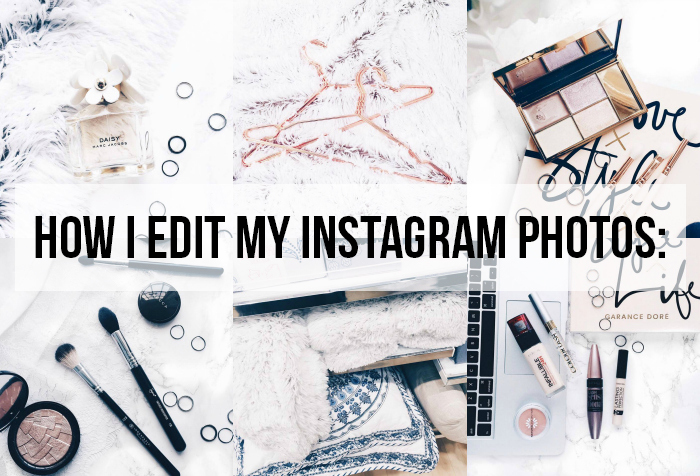 And I thought it might be useful for me to write a short, but sweet, post on what I do personally to edit my instagram photos. It doesn't take long, and there are three main apps I use; Afterlight, VSCOcam and Photogene. Using Afterlight | I mainly use afterlight to up the brightness of my photos. If I've taken a photo in natural daylight I'll usually only do this about halfway, but if the original is a little darker, I'll go all the way up. Upping the brightness can jeopardise the details in the photos though, so I'll usually go in and add some contrast and sharpen the image too. Using VSCOcam | I find that VSCO cam really makes or breaks an image for me. I firstly go in and add the 'HB2' filter; this brightens the whites of the image, whilst adding a slight blue tinge to the focus products in the photo. I then go in with 'HB1' which again just adds a further brightness. It's these two filters that really get my photos looking like I want them to. Using Facetune | If the background of my photos aren't as white as I want them to be, or are looking a little dull, the 'whiten' feature on photogene is a bloody miracle worker. It can seriously transform a picture from zero to hero in about 0.12 seconds - just try it. Not too difficult, right? I've finally got my editing routine down to a T, and I'm quite happy with how my photos are looking if I do say so myself!